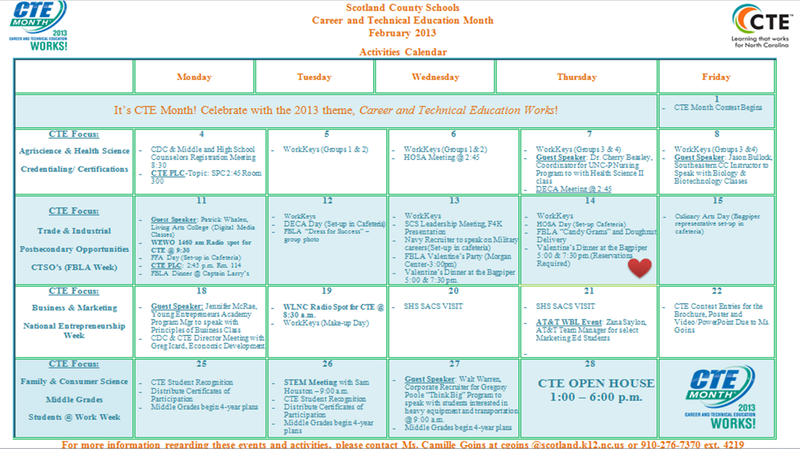 It’s CTE Month 2013 in February! Career and Technical Education Works! Eligibility: Every student enrolled at Scotland High School is eligible to participate in the CTE Month Brochure, Poster, and Multimedia Contest. The CTE Department needs your help in promoting the new image of CTE. Students are asked to design a new brochure, poster, or develop a multimedia presentation that will help to promote Career & Technical Education throughout Scotland County. Winners: There will be a winner in each category (Category 1-CTE Brochure, Category 2 – CTE Poster and Category 3– CTE Multimedia). Please see Mrs. Camille Goins, Career Development Coordinator in the Career Center Room #144 for a contest entry form. DEADLINE for all submissions is February 22, 2013. Biotechnology Competition– This competition is open to high school age students in North Carolina having conducted research in biotechnology. North Carolina Biotechnology Center in Partnership with the North Carolina School of Science and Mathematics will provide this opportunity for HS students to compete for an all expense trip to the National Bio Conference to compete on the international level. If questions, please contact Myra Halpin at halpin@ncssm.edu. National guidelines http://www.biotechinstitute.org Students must submit papers by March 1st. to: http://www.biotechinstitute.org/node/2607.